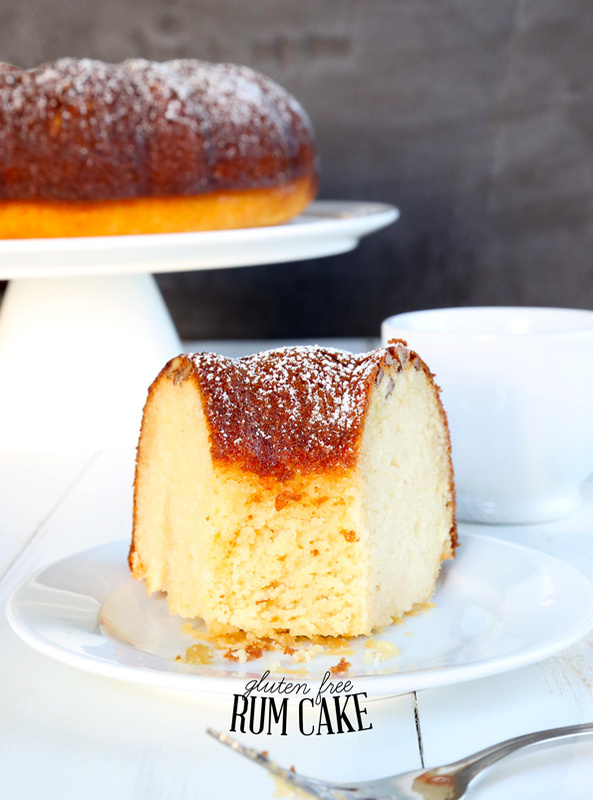 Gluten Free Rum Cake | Great gluten free recipes for every occasion. 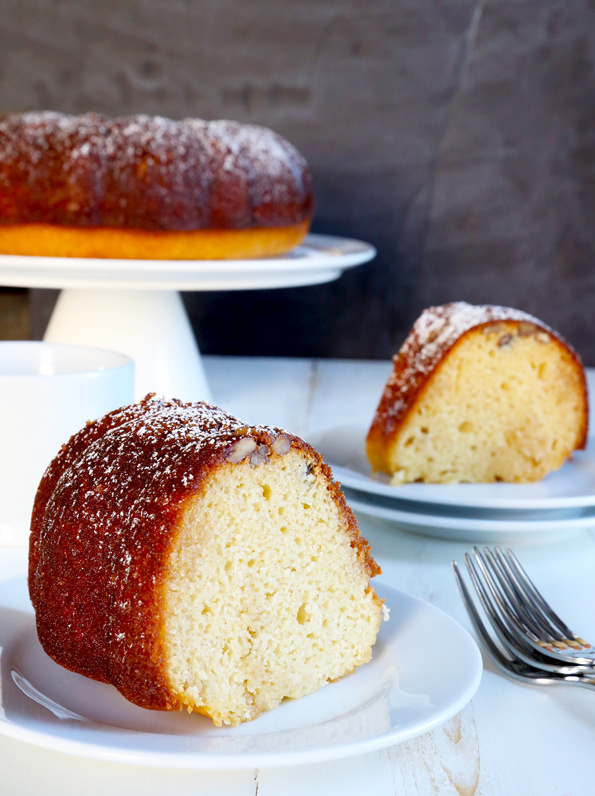 This simple gluten free rum cake is a ridiculously moist, not-too-sweet bundt cake with a butter rum glaze that will make any occasion festive—and not just because it has booze. In fact, the rum baked into the cake is minimal and bakes off (at least mostly), and the way I make the buttered rum glaze, most of the alcohol has a chance to boil off there, too. Since I know you love to tinker, I have provided as many substitution suggestions as I can. It is a rum cake, though, so if you try to eliminate rum altogether, well, then it’s not a rum cake. You get the idea! I used to consider nuts (especially in brownies!) to be sacrilege. These days, I realize that it has to be the right nuts for the occasion, and they have to be treated appropriately. In this rum cake, I found that I rather like pecans scattered on (what becomes) the top of the cake—particularly when they’re tossed with vanilla and a bit of sugar. If you’re anti-nuts-in-baked-goods, just leave ’em out! Well if this just isn’t the prettiest little bundt cake process, I don’t know what is. Can you see how the cake just soaks up that glaze like nobody’s business? Mmmmmm…..
Not only does the glaze flavor the cake so beautifully, but it also keeps it fresh for days on end. This cake can easily be made days ahead of time (my last cake is at 4 days covered on the counter at room temperature, and still going strong) and you can still proudly serve it to guests. It’s just that good. But don’t refrigerate it, whatever you do, as the refrigerator dries out baked goods in a flash. Either keep it on the counter, covered, or wrap it tightly in freezer-safe wrap and freeze for longer storage. But it’s so good when it’s warm out of the oven and has just been glazed. So, promise me you’ll try it at least once that way? *Pure rum, without flavorings or additives, is gluten free. You can use anything from dark rum to light rum, depending upon your taste preference. If you would like to try to make this cake completely alcohol-free, try using water in place of the rum in equal measure, but add a fair amount of rum extract. As always, feel free to experiment! First, make the cake. Preheat your oven to 325°F (or 300°F if you are using a dark-colored bundt pan). Grease well a standard bundt pan. 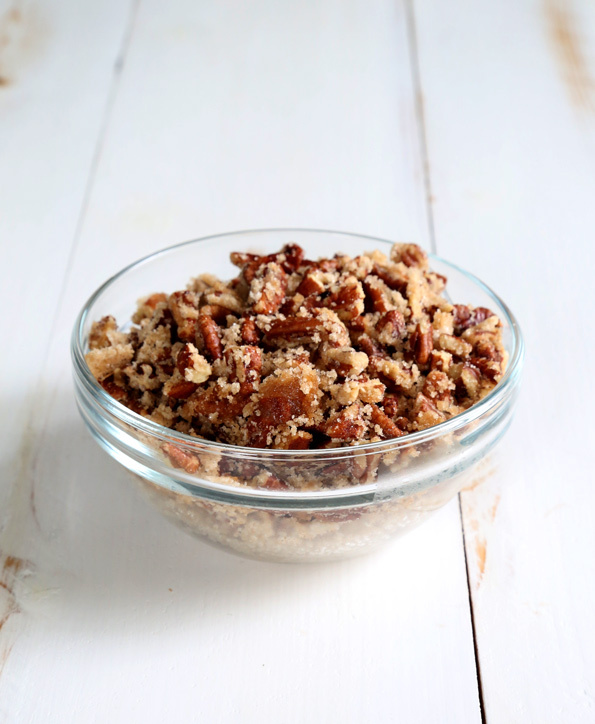 In a small bowl, place the chopped raw pecans, vanilla extract and 1/8 cup (25 g) granulated sugar, and toss to combine. Scatter the sugared nuts evenly on the bottom of the prepared bundt pan, and set the pan aside. In a large bowl, place the flour, xanthan gum, nonfat dry milk, cornstarch, baking powder, baking soda, salt and remaining 1 1/8 cups (225 g) granulated sugar, and whisk to combine well. Create a well in the center of the dry ingredients, and add the canola oil, rum, eggs and milk, beating to combine after each addition. The batter should be thickly pourable. Pour the batter evenly on top of the chopped nuts in the bundt pan and shake into an even layer. Place the bundt pan in the center of the preheated oven and bake until a toothpick inserted in the center of the cake comes out mostly clean, or with a few moist crumbs attached (about 45 minutes—or 40 minutes for a dark bundt pan). Be careful not to over bake the cake, as the bottom will burn easily. Remove the cake from the oven and allow the cake to cool in the pan for 10 minutes. While the cake is cooling, make the glaze. In a small, heavy-bottom saucepan, place all of the glaze ingredients except for the rum. Bring to a boil, stirring frequently, over medium heat. The mixture will begin to bubble. Remove the pan from the heat, add the rum, and mix to combine. The rum will cause the mixture to bubble up quickly. Just stir until the bubbling subsides, which will happen quickly. Return the saucepan and bring to a simmer over medium heat, stirring occasionally, until the glaze is reduced by nearly 1/4 (about 5 minutes). The glaze should bubble gently while it is reducing. If it bubbles too fiercely, reduce the heat. Glaze the cake. Pour the hot glaze evenly over the warm cake, still in the pan, and allow to sit until the cake has absorbed the glaze (about 10 minutes more). If the glaze is slow to absorb into the cake, pierce the top of the cake in a few spots with a butter knife. Carefully pull the cake away from all of the edges of the bundt pan with a butter knife before inverting it onto a serving platter to unmold it. Dust lightly with confectioners’ sugar and serve warm. Adapted from allrecipes.com, as selected by you from my Must Make Gluten Free Pinterest Board. I make coconut rum cakes every Christmas and this is the first year that I’m gluten/dairy-free. I’ve been scouring the internet to try to find a recipe and I could not be more excited to receive this one in my inbox this morning. Can’t wait to try it! I am anti-nuts-in-baked-goods. I have a bumper sticker, and pass out flyers door-to-door before every election. “No soggy nuts.” But if you say they are ok in this, I may have to give it a try. I guess I’ll have to buy a bundt pan! I had one BC (before celiac). o my mom loves rum cake!i am going to make this for her for Christmas. so excited about the new book! Looks gorgeous! I’ve never had one of these before since we don’t do alcohol, so thank you for suggestions on making it alcohol-free and corn-free along with your always-welcome gluten-free perfection. I sure hope someone is going to feed you something delicious over the holidays that you didn’t have to invent and make yourself! My mom always made a similar cake with a yellow cake mix and cream sherry. I’m so going to try this and substitute the rum for cream sherry! We made that cake in my family, too. It was a fixture at every funeral or other family gathering. Pretty and delicious! Sadly, I, too, cannot partake in this beautiful Rum cake. However, there is so much available on the blog that I have yet to try! So much baking to do, so little time! Is the dry milk still necessary if I intend to use Cup4Cup? Yes, Melissa, you still add the dry milk. i was wondering the same thing. thank you Nicole! I know this is off-topic, but thought I’d share…I did some research into alcohol burning off food and found it depends on the cooking method, length of time, etc. It can range from 5%-85% of alcohol remaining in food. The U.S. Dept. of Agriculture has a chart: http://www.oasas.ny.gov/admed/fyi/fyi-cooking.cfm (Not sure if readers can post links). Thought this might be helpful for those serving food to guests who are recovering alcoholics (they shouldn’t have any food with alcohol) or who have to avoid alcohol for medical reasons. I love the sound of your recipe, though, Nicole, and I’m jealous of those who can eat it!! Love rum cake! I have some rum in the cupboard, so may have to bring this to my book club this week. Thanks so much! A friend of mine makes a gluten version and somehow soaks it with extra straight rum. Whoa nelly! It’s always popular, though. Oh yes- definitely. Also best not to eat it around lit matches. Had to come back and post that this cake came out very well. Very moist, with a great flavor. Everyone liked it! This cake looks so beautiful and sounds delicious! I can’t have alcohol and I’m not sure if it all cooks off (I need to research that some more). I’ve been meaning to tell you I love your photography, too! Even if I can’t make something, I love just looking at the pictures on your blog!